Our Own Record Breaking City Champion! 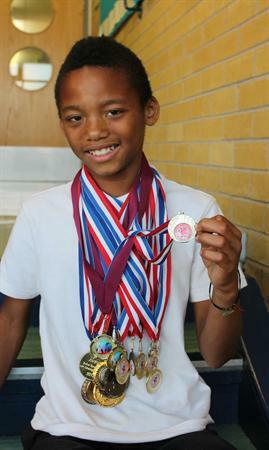 Devontay is now the proud record holder of the City of Liverpool Year 6 boys 75m title. The City championship took place at Wavertree Athletics Centre on 16th July 2013. Devontay had claimed the district title on the 8th July 2013 and had emphatically earned his place in the City final. Devontay won the race by a clear margin. Another City Championship title for this outstanding athlete, who has had a glittering primary athletic career and has represented his school and city in athletics. The previous record has stood since 1992 it was 10 seconds, the new time is 9.96seconds. Long may it stand!!!! !